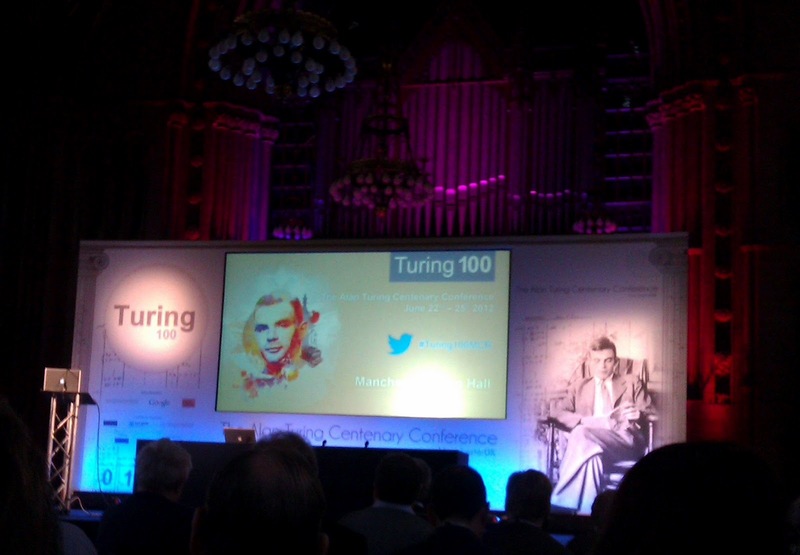 I've been attending the Alan Turing Centenary Conference in Manchester. The conference was in the huge and beautiful Manchester Town Hall, and it feels very appropriate to hear these talks in Manchester where Turing worked. The conference was over a weekend, including Saturday 23rd June, which was Turing's birthday 100 years ago. There were too many talks to write about all of them, but here are a few comments on a few of the talks from Day 1. Vint Cerf is Chief Internet Evangelist for Google, one of the creators of the internet and of TCP/IP. He described the early days of the internet, how they had to make decisions about the size of the address space they would need in order to address each of the devices connected to the internet. Imagine their problem in the 70s, trying to work out how many computers there would be in the future. Now there are about 2-3 billion internet devices connected at any one time, and a load more devices only intermittently connected. Everything is now becoming networked, including Cerf's wine cellar, which of course has a sensor network measuring temperature, humidity and light conditions, and will send an alert to his mobile phone if his wine becomes too warm. See Vint Cerf's talk. Yuri Matiyasevich talked about number theory, which was yet another of Turing's many fields of work. Turing wrote a few papers in number theory, looking at the Riemann hypothesis. During telling us about the Riemann hypothesis, Matiyasevich told us about Skewes number, "the largest number that served any definite purpose in mathematics" according to Hardy, which was a massive lower bound of 10^10^10^34. In 1939, Turing applied for a grant from the Royal Society for just £40 to calculate information about zeros in the Riemann zeta function. This rather small amount of money was to buy parts in order to adapt some machines for predicting tides to the purpose he had in mind. Matiyasevich showed a picture of a tide prediction machine, and it instantly gives an impression of the "technology" that Turing was working with at the time. Apparently, Turing was fine with the fact that his machine gave its output in base 32, stating that he was "sufficiently familiar" with reading numbers in this form that it wasn't a problem. See Yuri Matiyasevich's talk. David Ferrucci is the main man behind the Watson system that beat humans at the American quiz game 'Jeopardy' talked about the creation of Watson. Although Jeopardy isn't a Turing test, it is a test of general knowledge, and in this case a machine was competing against humans. His team of about 20 people put together many components (parsers, entity and relation extraction, knowledge base and search techniques etc) and then tested the system as a whole as the primary metric, not any one component. Initially it took 2 hours to answer a question, and some serious parallelisation of tasks was needed to make it fast enough for the game show. He gave lots of examples of questions and answers in his talk, including a question that asked for the common theme between "shirt", "telephone" and "TV remote control", to which the answer was "buttons", though "made with petrochemicals" and "made by humans" were also valid answers suggested by Watson. See David Ferrucci's talk. Fred Brooks talked about Turing's Pilot ACE, a prototype of the ACE computer that Turing designed and wanted to build. Why did Turing's computer not take off? He suggested 3 main reasons: that he didn't publish his 1945 proposal, the machine was too late by the time it finally got built, and he didn't make it easy to program (didn't foresee how important that would be). Again we get the impression of Turing's amazing ability with numbers. Using backwards binary with the lower order bits on the left was no problem to him, but was not so easy for others. ACE also had other peculiarities: no accumulator, no general multiply, no straightforward conditional branch. Brooks recommended a new book by Simon Lavington, "Alan Turing and his contemporaries: Building the world's first computer", and he recommended everyone read von Neumann's EDVAC report on a much more practical machine. You can now see the Pilot ACE in the Science Museum in London. See Fred Brooks' talk. The conference even after day 1 was already giving a wonderful picture of how diverse Turing's contributions to computer science and mathematics were, and how far reaching his ideas would be. See also my writeup of Day 2 and Day 3 of the conference, and the online video recordings of the talks.